This is the central place to manage installed plugins. Currently it will only list all installed plugins. If the plugin allows interaction, you will be able to click on its title so that it displays a custom interface. 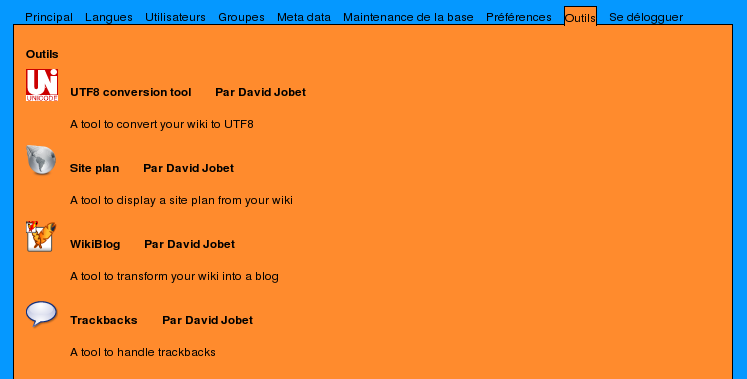 The trackback plugin and the wiki_blog plugin must be installed/configured this way before their first use. In the future you will be able to uninstall plugins from here too. And I hope I will be able to provide an installer plugin so that you can install a new plugin from internet right from here. And manually removed the directory of the plugin you want to "uninstall".